We seem to have hit Term 2 running and I am thrilled that we have 4 classes running now at full capacity, with 8 ladies signed up for each class. We are often asked whether we run classes – I am always on the lookout for new ideas and I’m very happy for people to come forward and offer to teach ladies new skills. If you have a talent that you are willing to share, please come in and talk to me. There are only so many hours in the day and some days it’s a bit of a stretch to get things done, so it would be lovely to share the load! There are still a few spaces available in this class which will be taught by Barrie Ashton, the NZ Wonderfil agent. At the end of this workshop, you will come out with a mini quilt using heart shape templates. The idea is to use threads from #8 through to the 100 weight ones and to see the difference you can get with different weight of thread. By using 15 different threads on the one quilt it ends up being a good reference tool.Cost of this class is $65 – you will need to bring your choice of a 60cm or Fat Quarter piece of Batik or tone on tone fabric for this project, and I have a list of the other requirements which you will get when you sign up. A 15 thread sampler kit is provided as part of the class fee. Since we seem to sell so much Kiwiana fabric at The Eye Of A Needle, we have signed up for the Gourmet Quilter 2018 Sew Along Project. 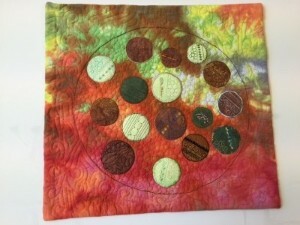 This is an opportunity for Quilters to make blocks towards a quilt with a Kiwiana theme. The Sew Along 2018 will run for 6 months, from May to October 2018. 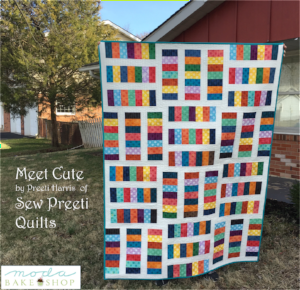 There will be weekly video tutorials and downloadable patterns for the 25 different blocks. There is also a Facebook group Sew Along 2018 for those who would like to join it so you can meet others making the quilt and share the fun. All you need to do is sign up and purchase the downloadable Sew Along 2018 pattern. You will receive weekly notifications with a link to download the pattern which will include a video tutorial link. There are 25 different blocks, including 8 different applique blocks, plus the alternate chain blocks. The downloadable pattern will come in weekly instalments starting in May 2018 and be running for 26 weeks. There are video tutorials for each block as well. We are one of the stores around New Zealand to have the fabrics available; all the links will be sent to you once you sign up on the Sew Along 2018 here. 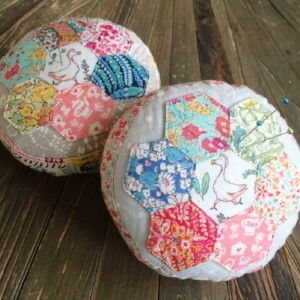 As we have a lot of beginner patchwork ladies, this class in an opportunity to learn how to make a simple patchwork pincushion using hand piecing techniques, and for somewhere nice to store those pins! Every stitcher needs a pincushion! For those of you who love to make bags, we will have our first bag making class that will run over 2 days on Saturday 7th July & Saturday 21st July. 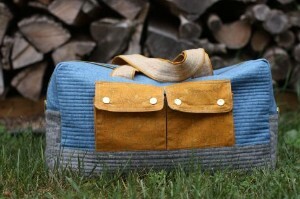 The bag you will make is from Noodlehead who make lots of samples using Robert Kaufman fabrics. This one is a Cargo Duffel bag, great to use as an overnight bag with cargo pockets or a baby’s nappy bag. We have a sample in store so drop in and have a look. There will be a maximum of 6 for this class which will cost $120 for 2 full days. Many people who come in to the shop comment on our lovely smells. We attribute a lot of this to the diffuser we use daily with Young Living Essential Oils. We are working on selling these 100% oils in store very soon. Our very good friend Stephanie is a trained massage therapist; she will be making herself available to us two days each month to do therapeutic massages. Did you know we have a consultation room out the back of our shop? If you are interested in booking in for a massage, we suggest you book early to avoid disappointment. We hope to offer this service on a regular basis and can highly recommend Steph. You will come out feeling refreshed and revived after an hour of deep relaxation AND you will smell divine! If anyone is interested in joining a fibre, knitting, crochet and felting group, some lovely ladies meet at the Harrier club rooms up by the pools every Wednesday from 11am-3pm. It costs $45 a year to join the Creative Fibre group and to receive a quarterly publication. An extra weekly fee covers tea & coffee supplies & the hall hire. Another group meets at the Motuaopa Boat club rooms every alternate Tuesday 7pm-9pm. I am told there is a wide range of knowledge in this group and anything goes! $2 for a cuppa. Next meeting will be on May 23rd. There have been a few people who don’t seem to be receiving our emails. Please check the spam folder on your computer. The details we have for you come from the database sheet on our counter. If you have friends who aren’t receiving our mail we may have misread their handwriting, so please feel free to forward to your friends if this is the case. I post a link to the newsletter on Facebook and I try to regularly post photos of new products coming into the shop there as well. We are waiting on a big delivery of fabric from Cotton+Steel plus some gorgeous baby flannel fabrics to come in this month. Lynette Anderson’s next range from Peacock Manor is due any day as well as a huge ‘Temperance Blues’ range from Washington Street Studio. For those of you who love French General – it’s coming soon too. I am a big fan of the blog written by Miss Mustard Seed and was delighted to read she has released her first fabric range through Free Spirit. I have ordered the whole range and can’t wait for it to arrive sometime in May! I hope you will love it as much as I do. There’s never a dull moment around here when new fabric arrives! It’s such fun planning projects around new fabrics when they arrive. As we head into cooler days, it’s a great time to start some inside projects, and we have a few to tempt you with, so pop on in to see what’s new in store.